I get so excited when I can create a project that involves solving a décor dilemma in my home while incorporating a unique stencil pattern! A few weeks ago I was given a gigantic frame in need of an update. I was quite happy to receive it, but in our 70’s home, with 8’ ceilings in every room but the living room, there was literally only one spot available to take advantage of this awesome gift: over our white sofa. Since Paint + Pattern is exploring Oriental design during the month of April, I decided to check out the Japanese Stencils Collection from Royal Design Studio for options. Even though my hubby was stationed in Okinawa before we met, our home décor style is anything but Asian. 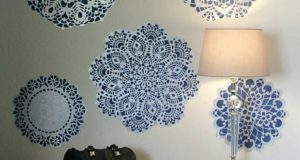 When I came across the Chrysanthemum All-Over stencil, I knew it would fit perfectly in our current room set up! 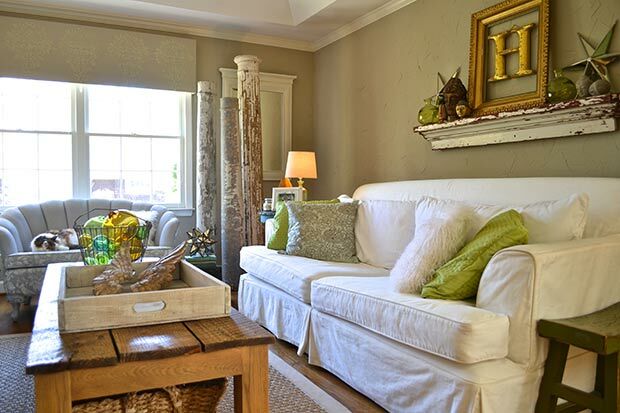 It is a wonderful large-scale floral pattern and blends beautifully with our simple room and the stenciled loveseat from another post. 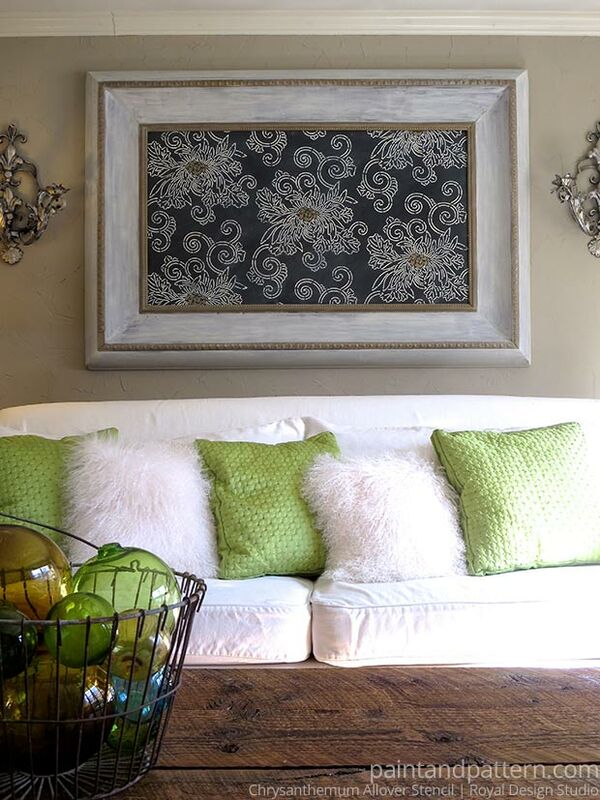 My goal was to create an artwork that looks almost like it was drawn with chalk on a board, and then mount it inside the huge painted frame to make it easily blend with the room. This actually turned into a 2-part painting project. After I finished stenciling the first part of the project that is shared below, I realized how badly the frame needed to be painted, but that is for another post. Today, let’s start with the stenciling! 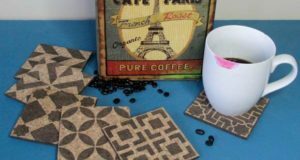 For those of you who are new to stenciling, this is a great beginner project, but the results look VERY professional. To give myself a base for the artwork I measured the inset area in the back of the frame and had a piece of 3/16” hardboard cut at the local hardware store. Then, I simply rolled on two coats of Graphite Chalk Paint® by Annie Sloan. While waiting for the paint to dry I found the centers of the board and the stencil. Then I placed the stencil in position, placed tape under the little arrows and marked them with a pen. This allowed me to move the stencil into position as I moved it around to fill in the pattern. 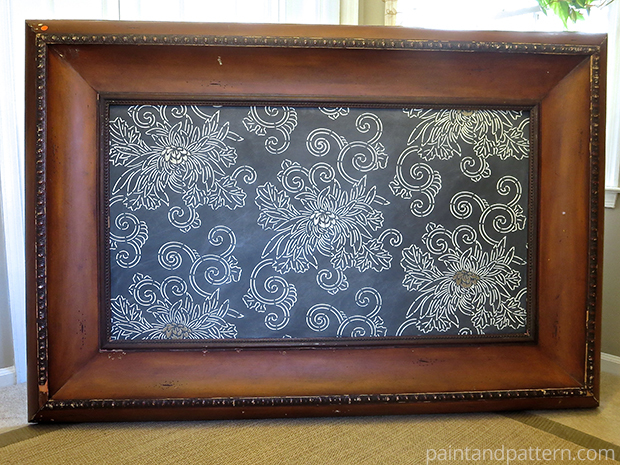 I used Old White Chalk Paint® and a 2” Royal Design Studio stencil brush to stencil the entire board. For the stencil newbies: simply dip the tips of the brush into the paint, off-load the excess onto paper towels and use a swirling motion to fill in the pattern. 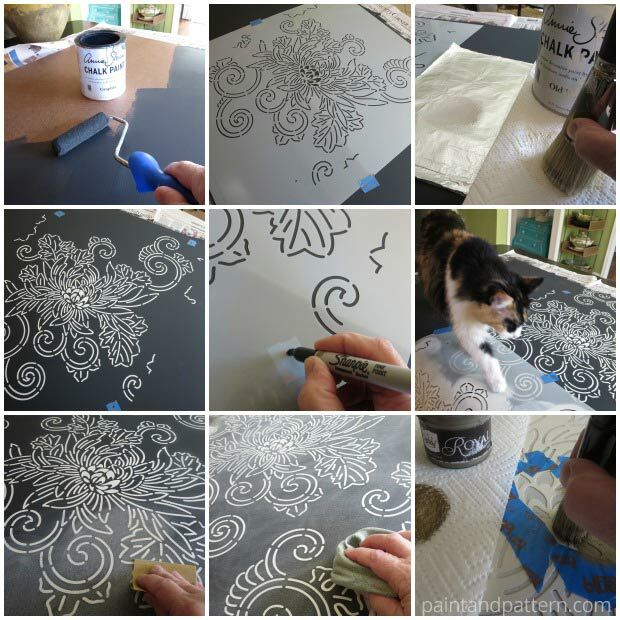 If you want or need more details on stencil techniques, visit the How To +DIY area on Paint + Pattern. I lightly sanded the entire stenciled area with 220 grit sandpaper and wiped off the residue. The sanding made the stenciled art look more like a chalkboard. Once complete, I used Painter’s Tape to tape off just the center area of the flower. 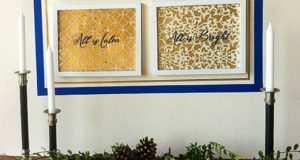 Then I replaced the stencil and used Royal Design Studio Antique Gold Royal Stencil Crème Paint to enhance the design and coordinate with my room. I love the results so far, but the frame is clearly in need of a paint intervention don’t you think? 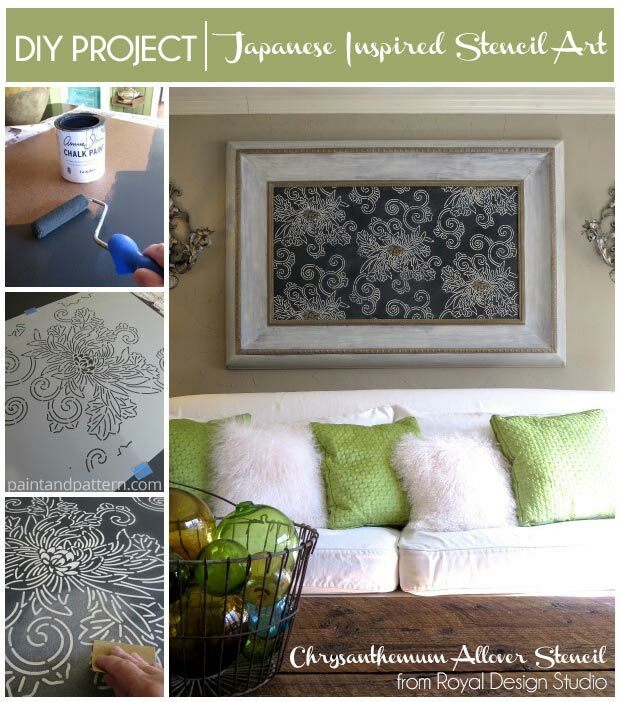 Stayed tuned for Part Two of this Japanese Inspired Stencil Art post, and we’ll use some Chalk Paint® and more Antique Gold Royal Stencil Creme to make some magic happen! Thanks Deb, I love our bungalow but it has its issues. Glad to find solutions that I love for a long time. 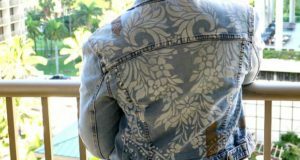 It works perfectly – love the pattern, too! Great project, Deb! Love it Regina, so calming! I agree Rose! Hope you like the next post for the frame finish project too. Are you done yet Celeste? The total look of your web site is magnificent, let alone the content!